Today we rode 83km from Kostryn to Strausberg. The ride was characterised by humidity and biting insects. Luckily we had another early start, as by midday the heat was really building and we were happy to get to our destination at around 2pm. Much of our route was along the Euro-Route R1 – one of the oldest bicycle routes in Europe – though we did divert from this route once or twice. 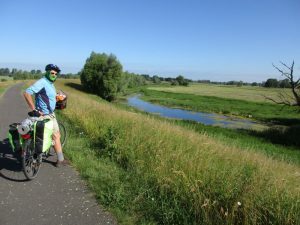 The first part of the ride was alongside the river Oder again – the river bed is very wide here, you can barely see the river. 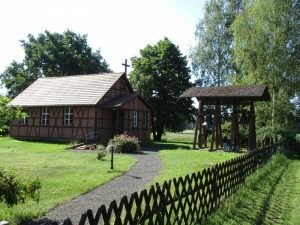 Just after we turned away from the river we passed through a tiny town – Sophienthal – where we saw another stork family – and an unusual arrangement instead of a bell tower, at the church. 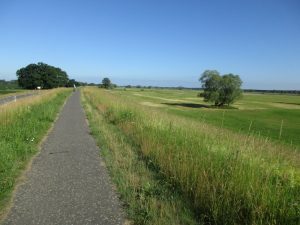 From here we traveled at a good pace along small country roads, alongside wheat and corn fields – we passed through Letschen and by-passed Neuhardenberg. 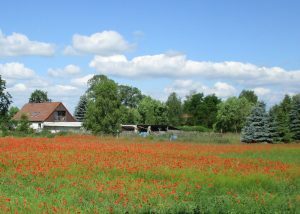 Eventually we entered the Markische Schweiz nature reserve area and the roads became more varied. We had some hilly forest roads, with lots of flying insects – we tried to keep moving at a good speed as every time you slowed down or stopped they were buzzing around your head. Eventually we reached Buckow which seemed like a big town and we planned to stop for some refreshments. There were lots of cobbles and neat smart houses with rose gardens, and some youth hostel places, but we never passed a shop or cafe, so it was a disappointment. 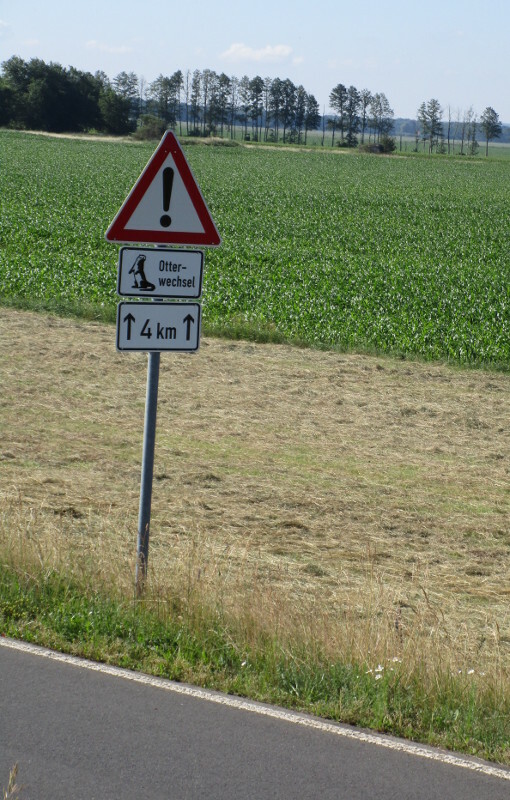 We lost our route a bit from here and ended up going through Harzenholz and then Garzin. The road to Garzin was unique – a long stretch of cobbled road, but with a narrow strip of good brick surface along the side – just wide enough to cycle on. A good way to discourage cars from the road, while keeping it cycle-able. 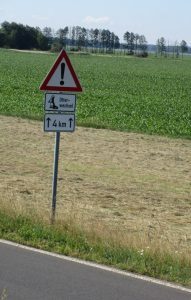 The next piece of road – to Hohenstein was very uncomfortable to cycle on – with some sandy patches that made it hard going – we were also getting very hot and thirsty at this point. Kris asked a couple sitting in their garden in Hohenstein for some water – it was such a relief to have a drink. 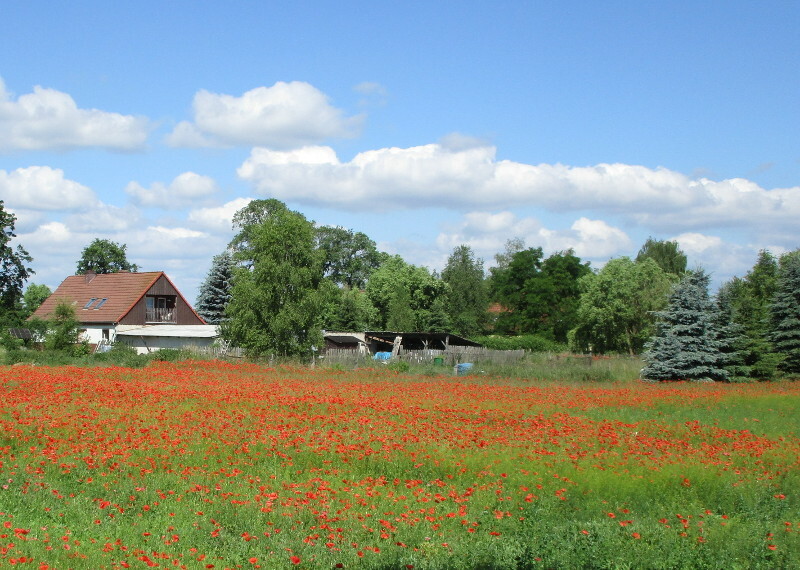 From here it was not far to Kosterdorf, where we passed a large military base. Just beyond this was our hotel in the north of Strausberg, and happily near a supermarket. We bought some food at the supermarket and ate some ice cream, before making our way to the hotel. We got there at around 2pm and it was already so hot that you didn’t want to be outside. Our hotel was expensive, but it is a nice big room with air conditioning, which is a bonus. We decided to go to our Berlin accommodation two days early, rather than try to source other accommodation in Berlin.